Cute one! We have a Precious Moments board book that’s very cute — lists little blessings. And I am featuring a cute one tomorrow from my childhood! You’re right – most of Vance’s favorite books weren’t the flashy ones. This sounds like a wonderfully sweet book. Adorable! 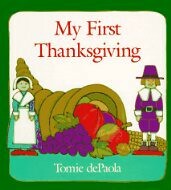 We looove Tomie dePaola. I like the idea of this feature. I would help you with the button if you like. Email me what you are looking for and I can send you a few ideas. Visiting from the Kid Konnection! Thanks for sharing your Thanksgiving book. My son’s favorite one this year (and last year) is A Turkey for Thanksgiving by Eve Bunting. I did our review on my reading list from this week. I’m #10 on the Konnection list. De Paola is captivating no matter how young or old you are!